SMS contains a numbers commands for modifying feature objects. The majority of feature objects commands can be found in the Feature Objects menu. Select one or more coastline arcs. The ocean arc starts and ends at the extreme ends of the chain of arcs. Select two vertices or two nodes. 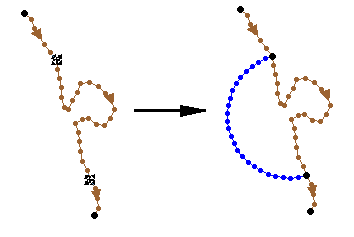 The ocean arc starts and ends at the nodes. Select a single node or vertex along the coastline arc. Define the radius of the ocean arc and the ocean arc starts and ends where it intersects the coastline arc. Select a single disjoint point. If the point is inside a closed coastline arc (an island), specify the radius of the ocean arc. The ocean arc is a circle that encloses the island. 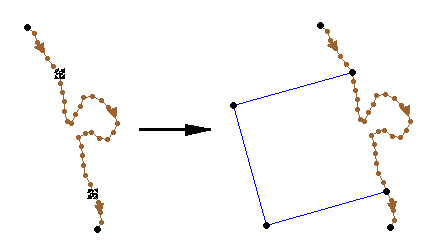 Rectangular – If selecting two points or an arc, only set the Offshore Length. 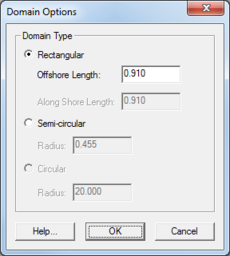 If specifying a single point, set both Offshore Lengths and Along Shore Lengths. 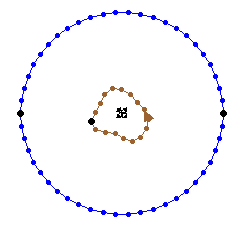 Semi-circular – If selecting two points or an arc, do not specify the radius, the radius is the distance between the points. If specifying a single point, set the Radius. Circular – Sets the Radius. This option only works if one point is selected. Clear Selection – Undoes the selection of the object that was clicked on. Invert Selection – Selects every object of the same type selected, and undoes the selection of the object that was originally selected. Zoom to Selection – Zooms to a closer view of the object selected. Optional menu items appear according to the active coverage type. When this command is invoked, the Create Contour Arcs dialog opens. For more information, see Arcs: Create Contour Arcs. This command is available if the current coverage type is ADCIRC, or CGWAVE. See the article Feature Stamping for more information. Model Control – See ADCIRC Model Control for more information. Create Coastline – See above for more information. Define Domain – See above for more information. Model Control – See CGWAVE Model Control for more information. New Grid Frame – See the article Grid Frame Properties for more information. This page was last edited on 11 October 2017, at 15:12.